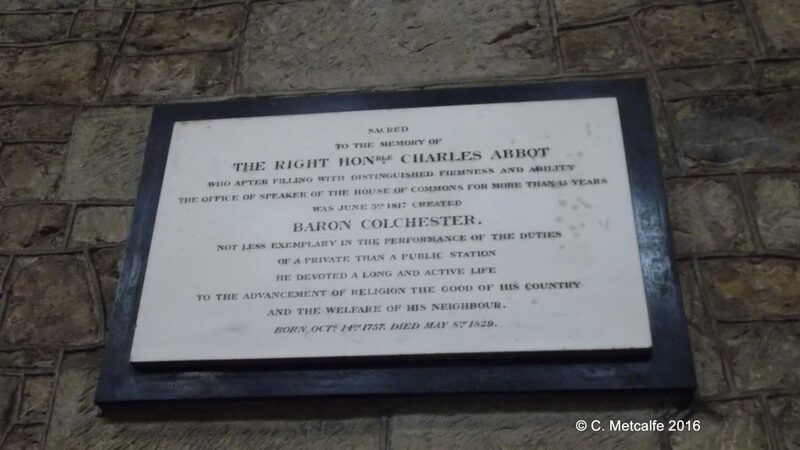 This memorial to Charles Abbot (1757-1829) is on the south wall of St Swithun’s church. Charles Abbot bought Kidbrooke, in Forest Row, in 1802. This was in the parish of St Swithun’s at this time. The tower of St Swithun’s was being rebuilt, following its collapse in 1785, and Abbot asked for it to be an extra 30 feet higher, so that he could see it from Kidbrooke. William Inwood, who modified the tower, adapting the design of James Wyatt, was a protege of Charles Abbot. Abbot wrote to the Home Secretary, asking that on days when his wife was being brought into East Grinstead, presumably in a carriage, the bodies of highwaymen, publicly displayed, should be removed. At Kidbrooke, purchased from the 16th Earl of Abergavenny, Abbot made great improvements and employed Humphrey Repton to lay out the park. Charles Abbot was born in 1757 in Abingdon and was the son of the Rev’d John Abbot, who died in 1760, and Sarah, daughter of John Farr, citizen and draper of London. Abbot was educated at Westminster School and at Oxford. He became a barrister. Charles Abbot was a step brother to the philosopher Jeremy Bentham (1748-1832). However, the death of Bentham’s mother apparently deprived the 7 Bentham children of family affection ‘which his father’s second marriage to Sarah Abbot, nee Farr…did not provide’, according to biographer F. Rosen. In 1796, Charles Abbot married Elizabeth, daughter of Sir Philip Gibbes, first baronet, of Spring Head, Barbados, and his wife, Agnes Osborne. Charles and Elizabeth had 2 sons. Abbot became MP for Helston, Cornwall, in 1795. Abbot had a passion for the preservation of historical records and the promotion of administrative reform, according to his biographer, Clare Wilkinson, who wrote that ‘his diligent but tactless investigations caused resentment’. Abbot promoted a Population Bill which resulted in the first National Census in 1801. Many historians and people researching their family trees today are very grateful for the Census information. A brief spell in Ireland as Chief Secretary to the Lord Lieutenant brought him a good salary but again ‘his probing enquiries and dictatorial manner upset influential figures’. 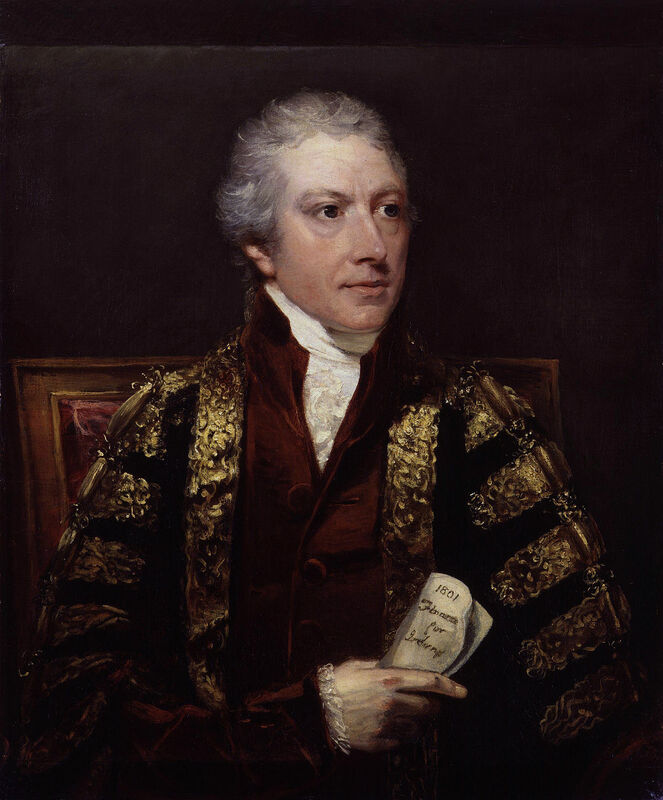 In January 1802, Abbot became Speaker of the House of Commons. King George III was not enthusiastic and did not want Abbot ‘to attempt novelties’; whilst one George Tierney spoke of ‘very general disgust’ at this appointment. Others caricatured his installation in the Speaker’s Chair saying that it would need ‘a moveable bar… like that used to prevent children from falling out’. (These details all come from Clare Wilkinson’s biography of Abbot in the Oxford Dictionary of National Biography). Abbot served as Speaker until 1817. Many came to respect his ability in this role and saw that his judgement was often ‘advantageously exercised on behalf of the House’. These were controversial times. The Great Reform Act of 1832, which took the first few steps towards our present electoral system, whereby each man or woman has one vote, was still far off. Poor King George III suffered from bouts of insanity, so his eldest son took on the role of Prince Regent, which had to be defined in Parliament. Roman Catholics were excluded from holding office at this time, and there was much debate and political activity to attempt to have this changed. In 1817, Charles Abbot resigned as Speaker due to ill health. He was created Baron Colchester. He died in London in 1829 and was buried in Westminster Abbey. His elder son became the second Baron Colchester, and his grandson the third, then this title became extinct in 1919. Charles Abbot, first Baron Colchester was an influential man locally. His memorial tablet and the height of the church tower are 2 tangible reminders of a man who was also important in the history of Parliament.